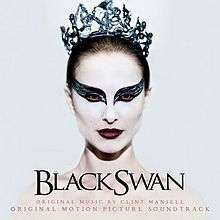 Black Swan: Original Motion Picture Soundtrack is the soundtrack album to the 2010 film, Black Swan. The album marked the fifth consecutive collaboration between Aronofsky and English composer Clint Mansell. Mansell scored the film based on Tchaikovsky's ballet Swan Lake, but with radical changes to the music. Because of the use of Tchaikovsky's music, the score was deemed ineligible to be entered into the 2010 Academy Awards for Best Original Score. Violinist Tim Fain was featured in performance both on-screen and in the soundtrack of Black Swan, and the film also featured various new pieces of music by English production duo The Chemical Brothers, although they are not featured on the official soundtrack. ↑ "Clint Mansell Interview". Clash. December 21, 2009. Retrieved December 12, 2010. ↑ Rich, Katey (December 2, 2010). "Interview: Darren Aronofsky On Music, Scares And Gender In Black Swan". Cinema Blend. Retrieved December 12, 2010. ↑ Wright, James (December 17, 2009). "Clint Mansell interview". Independent Film Channel. Retrieved December 12, 2010. ↑ "Academy nixes four score contenders". Variety. December 21, 2010. Retrieved December 24, 2010. ↑ "Culture Monster". Los Angeles Times. January 18, 2011. ↑ "Chemical Brothers pen new songs for "Black Swan"". British Music Guide. Retrieved December 24, 2010.